This new research from Stanford provides further proof that the B2B Managed Services model not only offers lower cost but higher business value than traditional approaches to integration. 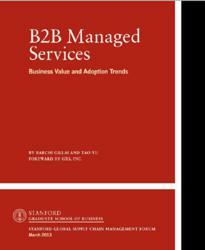 GXS, a leading provider of B2B integration services, today announced a new report from Stanford University’s Global Supply Chain Management Forum titled, “B2B Managed Services, Business Value and Adoption Trends.” Sponsored by GXS, the report analyzes the current state of B2B integration adoption and evaluates its potential growth. Report findings are based on a survey of nearly 100 users in North America, Europe and Asia, representing different industries including manufacturing, retail, financial services and logistics. The report found that 96 percent of respondents felt managed services has added significant value to their overall B2B integration programs. Respondents cited cost savings as a key benefit, with 74% indicating they received value from shifting up-front capital expenditures on software licenses to monthly operating expenditures for Managed Services. However, cost savings were not the most important benefit. Enhancing the customer experience to accelerate international expansion and improve business process efficiency was cited as one of the top reasons for choosing B2B Managed Services. The survey also found that 96% of participants plan to increase the number of customers they trade with electronically, the number of suppliers they trade with electronically, and/or the number of business processes they support. 59% of participants plan to expand their use of B2B e-commerce in all three areas. In fact, only 4% had no plans to increase B2B ecommerce in any of these areas. A full copy of the report is available for download here. GXS is a leading B2B integration services provider and operates the world’s largest integration cloud, GXS Trading Grid®. Our software and services help more than 500,000 businesses, including 22 of the top 25 supply chains, extend their partner networks, automate receiving processes, manage electronic payments, and improve supply chain visibility. GXS Managed Services, our unique approach to improving B2B integration operations, combines GXS Trading Grid® with our process orchestration services and global team to manage a company’s multi-enterprise processes. Based in Gaithersburg, Maryland, GXS has direct operations in 20 countries, employing more than 2,800 professionals. To learn more, see http://www.gxs.com, read our blog at http://www.gxsblogs.com and follow us on Twitter at http://twitter.com/gxs. You can also access our public filings with the Securities and Exchange Commission at http://www.sec.gov/edgar.shtml.